The OnSign TV team is extremely happy to soon deploy a major platform update which will dramatically improve your content organization, user management and streamline your operations. With many major customers adopting OnSign TV, we have been working on both UI and structural improvements so you can be more effective managing your signage network. On March 18th you are going to get the largest OnSign TV update ever! 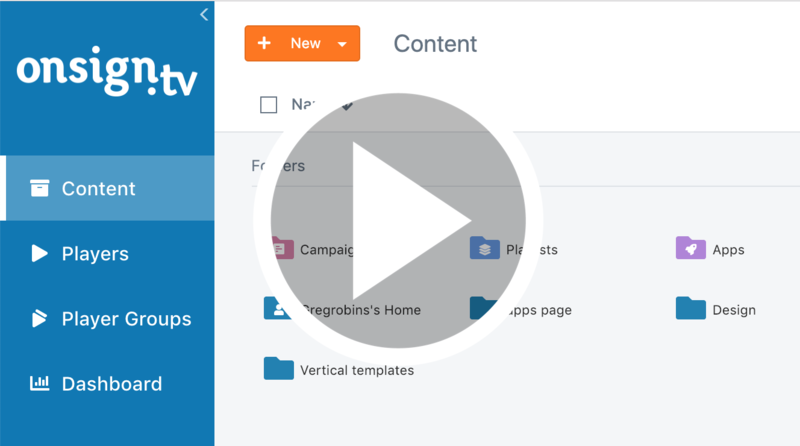 Although folders are not a new thing to OnSign TV, now you will be able to manage all supported elements, campaigns, playlists, images, videos, HTML, apps, compositions, and audio, within the same folder structure. The new folder structure goes beyond just moving things around. Inspired by Google Drive, Dropbox and other popular cloud storage solutions, now you can set user permissions to each folder. Better yet, the permissions are hierarchical, meaning they also affect all files and subfolders. 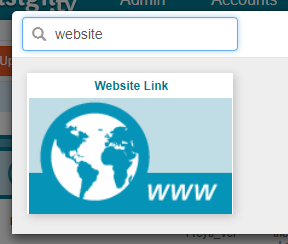 To support the new feature, we have also implemented a new sleek UI. Take a look at this video to learn more about our new features! Not a customer yet? Create your trial account! Playback duration - Get accurate playback duration for playlists and all content published to your players! App restart - This is a new and easy way to restart the OnSign TV player app without actually rebooting the whole system. It is a handy trick to force the player to start fresh and check the content you have just published. Optimize player schedule by keeping strict control over playback duration. Get accurate duration for a single playlist or to all content published to your players! Playlists are great for whoever looks for simplicity and flexibility. It lets you easily add, remove content and set restrictions to each playlist item. Avoiding too much back and forth, all is done in a single place. While the playlist is a powerful tool, things may get tricky once you build large and nested playlists, making it harder to determine the total playlist duration. Now you have a dedicated button to easily get playlist duration! Likewise, you can get an estimate for the current playback loop duration within the player “Campaign Playback Loop” menu. Now it considers playlist duration when campaign cycling is enabled! Important Note: Each time this page is loaded a different set of medias will be selected to represent playlists with cycling, this may also result in different total loop length. Although a new content published is downloaded almost instantly, the actual playback of the new medias will only start when the current campaign being presented is finished. This is a designed behavior to avoid content being interrupted on live screens as this would not be a good experience for your audience. Still, there are times you may want to start the new published playback right-away. A simple way to do it, is by restart the OnSign TV App! The Application Restart will quickly close and open the OnSign TV player without actually rebooting the whole operating system. This is a handy tool for those who want to force the playback of a new just synced content from start! Stay tuned! We have more great news every month! If you are in charge of content creation, certainly this will be among your favorite newsletters so far! 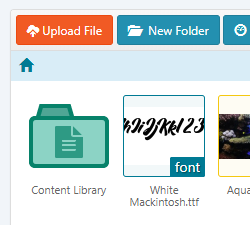 Features - Upload and use custom fonts. Player Option - OnSign TV now also runs on the latest Samsung Tizen Professional Monitors - SSSP5! Technology moves fast and we never fall behind! Following the announcement of the latest Samsung Tizen Platform, now you can install OnSign TV on the 5th generation of the Samsung Smart Signage Professional Monitors (SSSP5). This is a great option if you are looking for an SoC embedded solution! Just looking back, OnSign TV is also compatible with SSSP2, SSSP3 and SSSP4. Get to know all OnSign TV supported hardware platforms. Attention, designers! 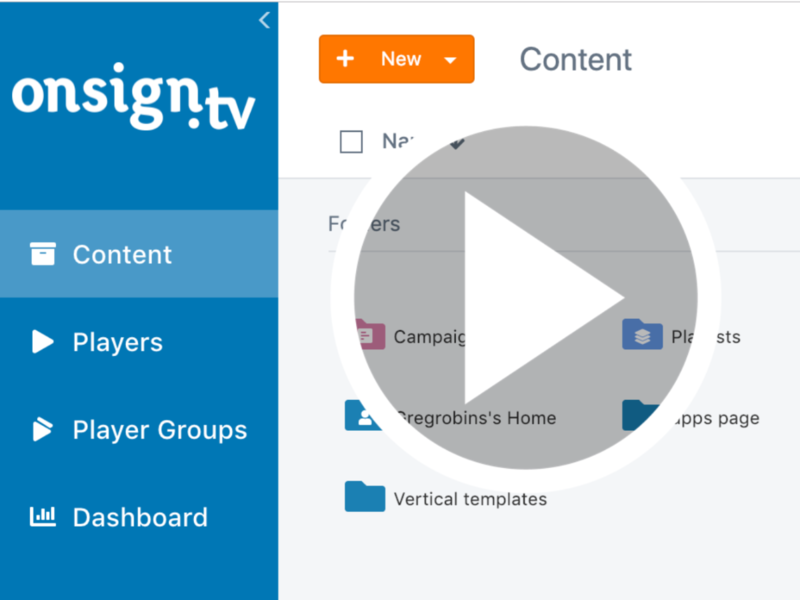 Now you can stick to your company or client visual identity by uploading custom fonts to OnSign TV in only TWO steps! Drag-and-drop your new font (TTF or OTF) to any content folder. 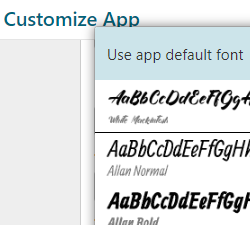 The new font will be immediately available on the font picker for all Apps! We have updated the App Selection UI, so more categories can be added shortly! Along the past year, OnSign TV added more than 20 new apps! Considering there is a lot to come, we have created a new app selection interface so you can browse through the ever growing content! 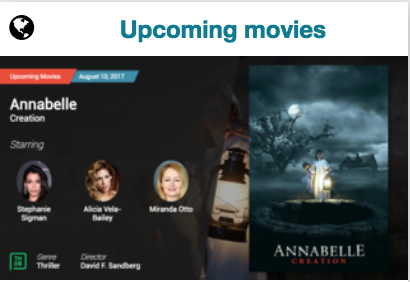 Now all categories are listed on the left menu. Multi-language support - Look for the apps marked with a little globe and translate your app to any language! More great news cominig soon!